New details emerged in Senate testimony revealing how Russia's Vladimir Putin directed a large-scale information "assault" on the U.S. presidential election to undermine the American democratic system, senior U.S. intelligence leaders disclosed during Senate testimony Tuesday. Director of National Intelligence James Clapper told the Senate Intelligence Committee that intelligence agencies did not seek to assess the impact the Russian activity on the outcome of the election. But Clapper said the combined Russian hacking and influence campaign was wide-ranging, continued for years and was among the most aggressive covert actions by Moscow in decades. "This is a multi-faceted activity and it began with a rather broad-gauged assault, if you will, to attempt to infiltrate many entities across the board—military, commercial, governmental, party-related," Clapper said. 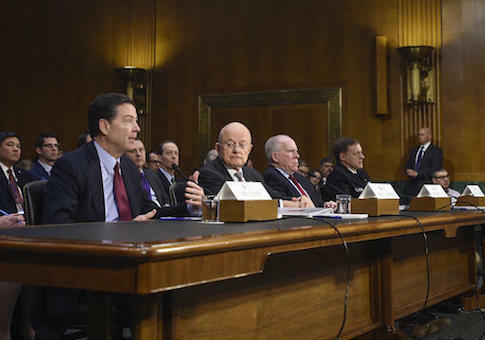 Testimony by Clapper, FBI Director James Comey, CIA Director John Brennan, and National Security Agency Director Adm. Mike Rogers included new details of what the U.S. government is calling a Russian cyber-enabled influence operation. The campaign was outlined in an unusual intelligence report made public last week. The unclassified version of the report stated that Putin directed two Russian intelligence agencies to carry out an operation to hack sensitive information from both Democratic and Republican political organizations and people. The hacked information, including emails and other internal documents, were then leaked to three Russian-influenced media outlets: a website called DCLeaks.com, Russian hackers using the cover name Guccifer 2.0, and the anti-secrecy website WikiLeaks. Clapper said the Russians at first viewed Trump as a minor presidential candidate but later in the campaign came to believe he would be more amenable toward Moscow based on his business background. "The Russians just believe, or came to the conclusion that because the president-elect is a businessman that he would be easier to make deals with than the Democrats," Clapper said. The bold information warfare operation by the Russians employed traditional intelligence techniques, including the use of deniability—lying by Moscow. "As we've seen, [Putin] I think always felt that he had deniability—both the Russian government and the Russian media are denying any culpability," Clapper said. In order to protect intelligence sources and methods, some of which cost U.S. taxpayers billions of dollars to develop, the United States has been constrained from aggressively pressing its case for Russian meddling, he testified. Putin, trained as professional intelligence officer in the Soviet KGB, "can just deny it and get away with it," Clapper said. Brennan, outgoing CIA chief, then stated that in early August he confronted FSB Director Alexander Bortnikov about the Russian election hacking. Brennan said he told the FSB chief that the "Russians were playing with fire" with the political interference and that the activity would backfire and be roundly condemned by both the U.S. government and the American people. "He said he would relay that to Mr. Putin at the time," Brennan said. "[Bortnikov] denied any type of activity along these lines. But I made it very clear to him that we were on to him." The FBI was denied access to Democratic National Committee servers hacked by the Russians. But a private security company shared the forensic data from the servers revealing the Russian cyber intrusions with the FBI. Russian intelligence did not succeed in conducting cyber penetrations of the Trump campaign, or the Republican National Committee. The Russians only gained access to data from old RNC domains and some state GOP computers. Russian intelligence hackers broke in to several state and local election boards and obtained publicly available voter registration databases. There was no evidence the Russians utilized the voter lists on Nov. 8, Election Day. New details about the election operation by the GRU military intelligence service and civilian FSB spy agency was obtained after the election. The intelligence report triggered a sharp political debate, with Democrats questioning whether Trump's stunning election upset victory was facilitated by Moscow. President-elect Trump has said the Russian operation did not affect the outcome of the election. Trump was briefed last week on the highly classified report based on communications intercepts, secret reports provided by human agents, and open-source intelligence. Some Republicans have charged the intelligence report on the Russian operation, ordered by President Obama, was politically motivated to discredit Trump. Critics also have charged that the intelligence agencies failed to make a solid case that Moscow sought to boost Trump's election fortunes and discredit Clinton. Aside from Russian influence activities, Clinton was dogged throughout her presidential campaign by FBI investigations of her use of an unsecure email server and by questionable past foreign and security policies while secretary of state. Clapper said there was no evidence voting machines or networks used for tallying votes were impacted by the Russian operations. The FBI, CIA, and NSA were the only spy agencies to take part in the assessment in order to protect sensitive source information, he said. Both the secret and unclassified reports were written by "seasoned, nonpartisan" intelligence analysts using "the highest standards of analytic objectivity," Clapper said, adding that the judgments reflect intelligence agencies' views and not those of the Obama administration. While tracing the origin of cyber attacks is difficult, Clapper told the committee that every cyber operation "leaves a trail" and for the influence campaign the trail led to Moscow. "We have high confidence that President Putin ordered an influence campaign in 2016 aimed at the U.S. presidential election," he said. "The goals of this campaign were to undermine public faith in the U.S. democratic process, denigrate Secretary Clinton, and harm her electability and potential presidency." Moscow also developed a "clear preference" for Trump, Clapper said, but also noted that when Clinton appeared likely to win her bid for the White House, Russia set out to undermine her future presidency—an indication the Russians did not consider Trump a likely winner. The information warfare tools used by the Russians combined covert intelligence operations with overt efforts by Moscow government agencies, state-funded media, along with third-party agents and paid social media users. Clapper said unlike China, which has been conducting large-scale cyber espionage operations he described as "passive collection," the Russian operations were aggressive. "The Russians are unique," Clapper said. They were caught "actively purloining information and then using it for a political end," he said. Committee Chairman Sen. Richard Burr (R., N.C.) said the committee is conducting its own investigation into the Russian activities. Burr said "we will follow the intelligence wherever it leads, and we will conduct this review in a nonpartisan manner." Committee Vice Chairman Sen. Mark Warner (D., Va.) said the hearing was not an effort to "re-litigate the results of the election." Warner said he supported the decision of President Obama to expel 35 Russian intelligence officers in the aftermath of the election operation. But Warner also questioned why Obama did not act sooner or take stronger measures. Warner said the panel will investigate the Russian hacking and release of stolen data; the use of propaganda outlets like the state-run television network RT; and whether there were contacts between Russians and any of the political campaigns or candidates. Comey, the FBI director, declined to comment when asked if the FBI was investigating ties between the Trump campaign and the Russian government. This entry was posted in National Security and tagged 2016 Election, Russia. Bookmark the permalink.